What would a lineup of under-25 NFL all-stars look like? Glad you asked. We polled 43 of our NFL insiders -- reporters, analysts, former players -- to find out which players under age 25 will be the best at each position over the next three seasons. The results included four Saints (the most of any team), three players drafted in April and nine players age 22 or younger. ESPN Insider Field Yates wrote the analysis of each selection. Few quarterbacks have galvanized a franchise as expediently as Watson did the Texans in 2017. 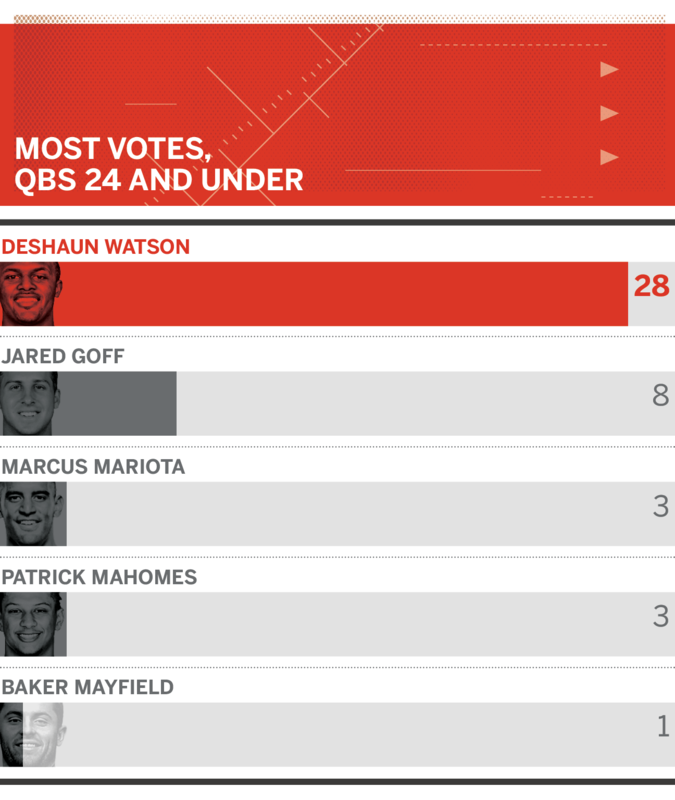 Watson, 22, has exceptional football IQ and character to lead teammates paired with unique arm talent (particularly in the vertical passing game) and dynamic athletic ability. Regardless of what Gurley's timed speed is -- and you know he's fast -- his functional play speed is even better. A step for Gurley, 23, in the open field usually means six points. With outstanding receiving skills and a diverse list of open-field maneuvers, he's a true dual-threat back. A projection for the 21-year-old Barkley based off a sterling career at Penn State, the Giants are hopeful that a skill set highlighted by an abundance of power, soft hands in the passing game and uncommon return skills will yield immediate returns. His polish on and off the field boosted his case as a can't-miss draft prospect. Diggs, 24, has shown the ability to dominate in different ways at the NFL level. He excelled as a vertical threat as a rookie, chewed up catches in a volume role as a sophomore and took another step in his third season. When the ball is in the air, Diggs is a good bet to win in man-to-man coverage. Hill has made his mark already as a speed threat in the NFL. It's not hyperbole to suggest the 24-year-old is the fastest player in the league, routinely impacting the game as a receiver, runner and returner. Hill has a compact frame but plays with some power, too. The reality of some NFL offenses is that tight ends are asked to serve frequently in a detached alignment, working in a slot role that requires immense athletic skills. Engram, 23, is in some ways a jumbo wide receiver, firmly cementing his spot as a bright spot in the Giants' offense as a rookie. While some still believe that the value of a left tackle surpasses that of a right tackle, Conklin's immediate emergence on the right side for Tennessee proves it's a position of massive influence. Powerful and technically sound, the 23-year-old is currently recovering from a knee injury. During a time when NFL teams are finding the challenge of identifying ready-made offensive linemen more difficult, Ramczyk, 24, stepped into a starting role right away. He played every snap in 2017 and handled multiple positions. Nelson was a near-unanimous pick, a reflection of his pedigree coming out of Notre Dame. The 22-year-old plays with a blend of nasty and surgical attention to detail. Indy hopes he'll set the tone for the line for a decade. The 24-year-old Peat is a dancing bear, an impressive athlete for a player of his size with positional versatility. The center position involves more than just meets the eye; Elflein, 24, absorbs great responsibility pre-snap in getting the offensive line in sync. His acclimation to the pro game from his college days was an expedient one. Rankins, 24, is unique in this sense: He's an immovable object in the middle of the Saints' defense that makes the group decidedly better against the run, while also adding value as an intention rusher. Williams' length stands out, as the long-levered and versatile 24-year-old defender makes it hard for an offensive lineman to stay engaged. His value will transcend his statistics, but those are already quite impressive. Bosa, 23, drew pre-draft comparisons to J.J. Watt, an almost unfair parallel for any player to face. And yet, he has been a dominant force with some shades of Watt in terms of next-level power and acceleration. Garrett was a bit limited by injuries as a rookie but made his mark all the same. He may have been the best talent on the Browns' roster last season when the team went 0-16. Much more impressively, the 22-year-old may still be the most talented player on an improved roster. The younger Watt, 23, is a terrific athlete and has the reactive skills to be a factor in coverage. Oh, did we mention he's already an immense force as a rusher for a defense that led the NFL in sacks last year? In a league where offenses stress a defense every inch of the field horizontally, Jack's athletic tools stand out. The 22-year-old has already established himself as a ferocious tackler, cooling any concerns over a serious college knee injury. Jones, 23, carries a rep as one of the game's best coverage linebackers already. He runs like an oversized defensive back while also setting the tone as a hitter. He's the quarterback of Atlanta's defense. Foster's NFL career is young, but what already stood out was his feel for finding the football. The 24-year-old must stay healthy and will serve a two-game suspension to begin the season, but he could emerge as San Francisco's best defensive player. Lattimore's ability to play on an island is reflective of his confidence, reactive athletic ability and ball skills. It's hard to quantify how much mental toughness impacts defensive back play; the 22-year-old Lattimore has a ton of it. No player earned a higher percentage of votes in this exercise than the 23-year-old Ramsey. The question may not be whether he's one of the best players under 25, but rather whether he's on track to becoming the league's best defensive player. Collins, 24, almost immediately emerged into a leadership role for the Giants. He's a check-the-box safety, with the ability to do almost any task asked of him. He'll make you remember his hits too, with excellent playing strength. Adams oozes confidence with good reason. His pattern recognition and proactive athletic skills will align with a bucket of interceptions in time, while he's also a player ready to run the alley as a box defender. The 22-year-old can hang in coverage versus tight ends. Butker, 22, had a historic season, as his 38 field goals for the Chiefs in 2017 were the most by a rookie in league annals. He has a cannon for a leg, nailing 38 of 42 attempts, connecting on all of his extra points and booming 78.2 percent of his kickoffs for a touchback. It's rare to see a specialist win the MVP of a bowl game for a major college program, be selected a unanimous All-American, forego his final college season or earn a fifth-round NFL selection. Dickson, the Seahawks' 22-year-old fifth-rounder in 2018, did them all. They hope for him to become a major weapon.